On Saturday, March 17th five breweries in East Ballard are teaming up for St. Patrick’s Day celebration. They’re calling it a Parade O’Pints, but there isn’t actually a parade involved. No marching bands or flowery floats. Instead, the parade will consist of beer drinkers wandering from one brewery to the next to enjoy special beers, commemorative glassware, t-shirts, food trucks, live music and fun. Participating breweries include Lucky Envelope Brewing, Obec Brewing, Populuxe Brewing, Reuben’s Brews and Stoup Brewing. Here’s the official event announcement with details about what’s happening at each brewery. 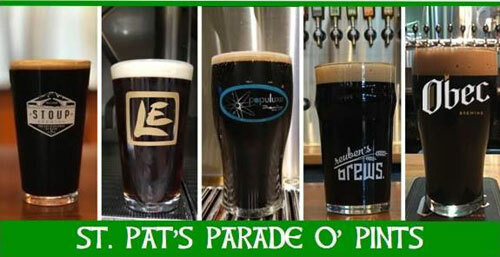 Lucky Envelope Brewing, Obec Brewing, Populuxe Brewing, Reuben’s Brews and Stoup Brewing are excited to announce the first annual St. Pat’s Parade O’ Pints, a neighborhood celebration of St. Patrick’s day featuring specialty beers, commemorative glassware, t-shirts, food trucks, live entertainment, & fun! Beers: Irish Lager – 5.1% ABV – Irish lager brewed with Skagit Valley Malting Talisman malt and flaked corn. The beer has a toasty, slightly roasty malt flavor from the heirloom UK-based malt. Corn adjunct lends a clean crisp finish. Irish Red Ale – 5.5% ABV – A velvety smooth and highly-drinkable Irish-style red ale. It is malt-forward with toasted bread notes with a light chocolate finish. Beer: Dry Irish Stout – Our dry Irish stout has a soft, smooth body and a full roasted barley nose. Light caramel and coffee favors give way to a subtle smoked and roasted malt character. It clocks in at a sessionable 4.2% ABV, perfect for lively debates over the merits of Beckett’s use of long run-on sentences. Beer: Soda Bread Stout – 4.5% ABV, 30 IBU – Dark and roasty, with creamy chocolate and coffee notes, this is a classic example of a Dry Irish Stout. Brewed to traditional session strength and served on nitro for an easy drinking, deceptively light beer in spite of it’s full-bodied nature. Get a taste of the Emerald Isle right here in the Emerald City! Food Truck: Peasant Food Manifesto featuring Irish Tacos made with corn beef and cabbage. Baby Ketten Karaoke the Celtic Way 7pm – 11pm- $1/beers for any singer who performs a song by an artist of Irish descent (i.e. Sinead O’Connor, Shane McGowan, the Cranberries – no Enya please). Beers: Nitro Dry Stout -This quintessential Irish style uses a dark, roasty malt to give a relatively bitter and dry finish. The nitro pour provides a nice creaminess to the taste. Irish Blood English Heart – This beer derives its name from a much beloved song by a musician who was born in England to Irish parents. This beer uses an Irish yeast strain, which provides bright, fruity notes on an English Brown malt bill. The result is a delicious, drinkable brown ale. Irish Red – This deep reddish Amber provides the perfect balance between the caramel malts, fruity Irish yeast, and bitterness. Entertainment: (ALL DAY): We will have the back of the brewery open, so there will plenty of space to enjoy your beers out back with some upbeat, fun Irish music playing. Beer: Extra Loud Stout – 4.7% ABV 36 IBU – Roasted Barley gives this highly quaffable, dark brew its distinctive flavor and dry finish. The beer is balanced with a hint of bittersweet chocolate and a rich, smooth creaminess from oat malt and a nitrogen pour. Entertainment: Seattle Firefighter’s Pipes & Drums, the beer’s namesake, will be playing in the tap room from 5-6pm. There is another brewery in that area, Dirty Couch Brewing. I’ve not heard anything from them and their Facebook page hasn’t been updated in nearly four months. I am wondering if they are still in business(?). I have heard nothing to suggest that they are no longer in business. Dirty Couch is a production only facility. No taproom. Not sure what they’re intentions are. Don’t forget that Maritime Pacific is nearby too. The breweries involved in this event are the breweries in the “Gilman Park” neighborhood. Just had a Dirty Couch sour at Zeeks Pizza of all places last week. I was really impressed. It was a barrel aged Kriek and better than any sour/Wild I’ve had from Urban Family, Spada, Holy Mountain, Reubens or Mollusk (and there’s are pretty tasty too). Wish they had a taproom. Thanks for the kind words Jason. I’m one of the co-owners at Dirty Couch. Just a heads up, we are working on a taproom in Magnolia. Opening is still to be determined but we’ll do our best to get the word once our plans are more concrete. This is just five of about a dozen really. Fremont, Bad Jimmy, Hale, Peddler, Maritime, Lagunitas. Probably forgetting somebody. Then across the canal for Rooftop, Figurehead, Urban Family. Kind of incredible. Outlander Brewing is in Fremont, so I guess they’re kind of in the mix.